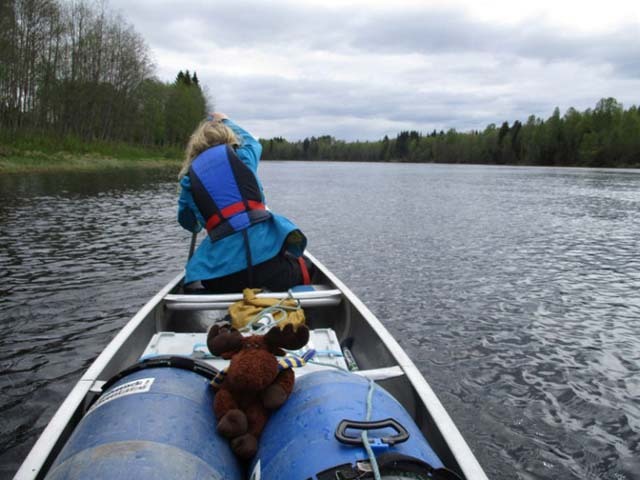 Jayne, Niki and Elky travelled to Värmland in May 2016 the first part of the trip was doing the 50km version of our Canoe Tours on Klarälven (doing the normal 4-day route over 3 days). The Kläralven is a wide steady flowing river (usually at around 2kmh) which meanders through the Värmland region in Sweden. This canoe trip is bookable as a 4 or 7 day trip and ideal for families, beginners or for those looking for a relaxing canoe trip. We arrived at the canoe centre in Gunnerud in the afternoon of a quite warm day in May (although according to the weather report there was supposed to be snow in the higher parts area during the coming week!) and after having a look around at the facilities at the centre we put our canoe on top of the minibus were driven up river to the start point for our Kläralven trip. This was also where we were to spend our first night is a small but cosy camping cabin with a fully equipped kitchen and, more importantly, after a day of travelling a shower and a comfy bed! 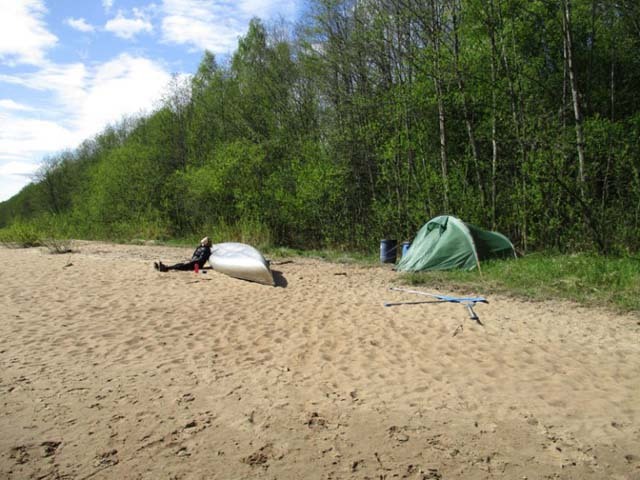 Choose a suitable spot and camp wild along the riverbank! Photo: Niki Nature Travels. The next day, after breakfast, we took all our equipment and belongings to the river bank to load the canoe once it was in the water and then we set off. Niki, Elky and I were to be doing the 4 day Klarälven route but due to our schedule we would have just 3 days in which to do it. The first part of the river is fairly straight with a few wide corners giving us plenty of chance to get into our paddling rhythm and we were soon speeding (relatively) down the river passing by a small village and a few houses as we went. A map is provided as well as a detailed route description. Photo: Niki Nature Travels. 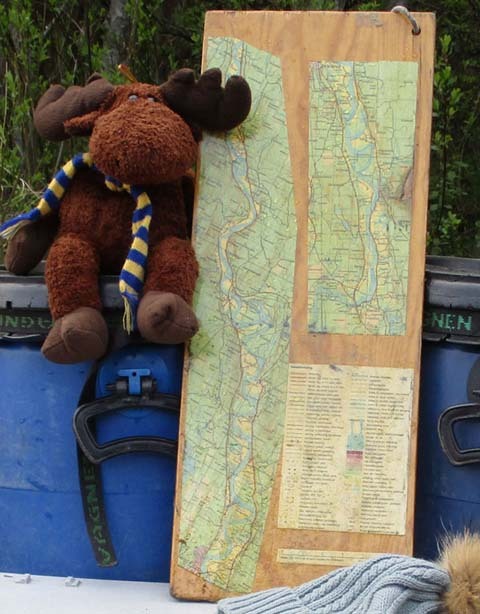 As part of our equipment we were given a laminate map on a piece of wood (so it floats should it end up over board!) on it was marked some winder shelters and a few dry wilderness toilets. For our first night’s camping we decided to stay at a wind shelter this was about 25km down the river and was close to a spot where we had been told we could canoe up a tributary to have a nice hike to a waterfall which we thought we would like to see. Fires are permitted along the way in accordance with the Swedish Right of Public Access. Photo: Niki Nature Travels. The wind shelter was in a large field, surrounded by trees and had a track leading to it which was obviously (judging by the fish sign on one of the trees) to allow fishermen to get to the river but as we were travelling in low season we had the whole place to ourselves. After putting up the tent we had a bit of an explore and collected some fallen branches from surrounding area to make a fire. 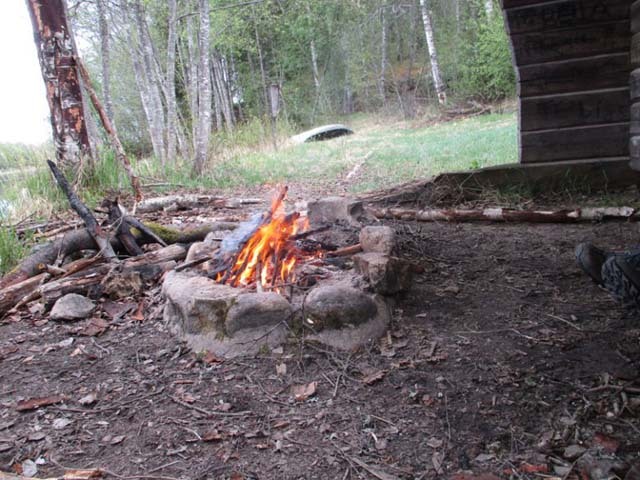 Once back at camp we made a fire and enjoyed the peaceful surrounding. On day two of our canoe trip we work to a grey but dry day, and after a somewhat more relaxed morning than planned we reluctantly decided that due to time constraints we perhaps wouldn’t have time to visit the waterfall without having to rush the rest of our canoe trip. We head down river determined to find a really lovely spot for lunch (and to camp in the evening) to make up for missing the waterfall. The wind-shelters at some points along the route are great places for a fire. Photo: Nature Travels. Soon we came to a small island to the side of the river and decided it would be the perfect spot for our lunch. The island was only separated it from the mainland by a small shallow part of the river and was clearly a popular spot for horse riders to bring their horse to the river, though the only signs we saw were the hoof prints! We sat eating our sandwiches and drinking our coffee enjoying the peace and quiet of having the whole river to ourselves. Once back on the river we passed by a few farms and under road bridges but despite this there was not much traffic to disturb the quiet of the river. The only signs of life we saw on the river banks were a few cows who stared at us inquisitively as we floated by. Towards the late afternoon the sun came out and it was starting to feel warmer, we decided it was probably time to start looking out for a spot to camp for the night. There were many places where we could have camped but none were just right for us (too many/not enough trees, too near to a house etc. ) until we came round a bend in the river and there on the right hand side of the river was a beautiful beach and wooded area, this was perfect! After landing the canoe we set about the most important task, making the coffee, one of us filled the kettle from the river whilst the other lit the Trangia. Even though we were close to a village and there were houses on the other side of the river (hidden by the bend or set far back from the very steep bank opposite) it didn’t feel like we were in a very populated area due to the surrounding trees and for the most part quiet (there was of course the occasional dog barking and a lorry or two driving by on the road (which we couldn’t see)). That evening after supper we were treated to a beautiful sunset. This river canoe tour is a tranquil and easy-going trip. Photo: Niki Nature Travels. Our last day dawned warm and sunny, as we only had a very short distance to travel back to the canoe centre we spent the morning soaking up the sun and paddling on our sandy beach (it was just a little too cold to actually swim though). Pack barrels are provided and are ideal for storing items such as sleeping bags or food. Photo: Niki Nature Travels. As we were packing the canoe ready to leave two hikers appeared from the woods, the only people we had seen since we were dropped off at the camping cabin three days earlier. They were very friendly and we had a short conversation with them before they headed back into the woods and we set off towards the canoe centre. For the last part of the trip we kept to the right of the river looking out for the canoe centre landing area which has steps leading up the bank (there are signs saying 1400 and 700 metres to help you find it and there is a second landing area just after the first should you not spot it in time as they are not large). Once landed we cleaned our canoe and left our equipment at the designate spots before setting off to our next destination, the Lakeside Cabin Retreat in Värmland. 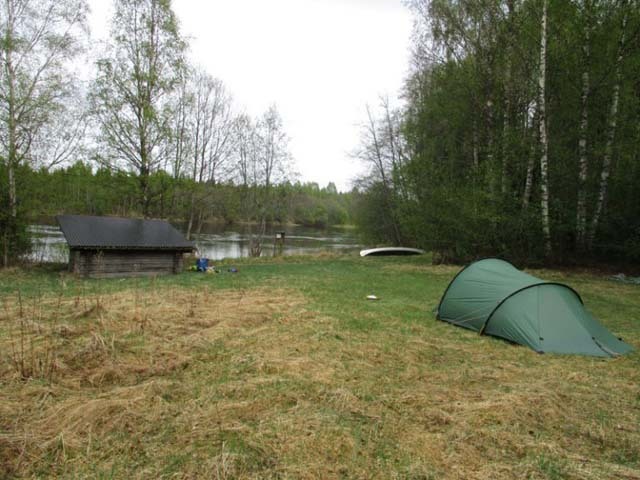 In addition to canoeing on Klarälven, we also offer the possibility to do the same route by timber raft. 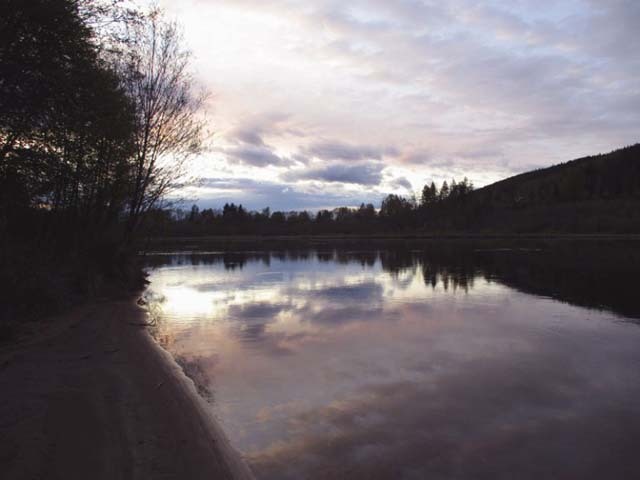 Alternatively, Värmland is also the location of a number of our other canoe tours: Canoe Tours on Svartälven, Canoe Tours in Bergslagen, and Canoe Tours on Rottnan/Röjdån.